Normally, Dr. Riven Mercer disliked cleaning the Kiryu Labs biological testing room. Listed simply as “Experimental Room 210”, it was less of an experimental chamber than an enormous haphazard collection of temporary quarters for various small living things. This meant that at any given time, there were usually some low-threat anomalous creatures in the room, such as the tortoise with the barbecue grill shell from eight months ago. Kiryu Labs rarely saw living anomalies for monthly processing caches, but nevertheless the room was kept well stocked with tall plants, various pet foods, and glass jars for obtaining samples and catching bugs. Of all the 18 rooms that made up the Labs’ anomalous item processing chambers, Experimental Room 210 was routinely the smelliest and noisiest. Not to mention the dirtiest, Riven thought as he tiptoed his way through some bushes near the entrance, since the floor is dirt. Dr. Mark Kiryu, Director of Kiryu Labs and resident bug-lover, was standing in the hanging mesh tent set up in the corner furthest from the chamber door, underneath the skylight window in the ceiling. The tent existed to house the anomalous winged animals sent to Kiryu Labs, and tended to need repairs once every few months due to being pecked at, chewed on, and occasionally set on fire. As Riven approached, he noticed two things: Mark was trimming a large potted ficus, and Mark had a small yellow bird on his head. “It’s a cockatiel,” Mark commented, snipping away at the ficus. Riven blinked. “I can see that. Is it anomalous?” Riven asked, walking closer to Mark in a half-circle to look at the bird from different angles. “Banana,” replied the yellow cockatiel helpfully. “Banana,” the cockatiel confirmed. It shifted on Mark’s head a bit as he stood up and placed the tree trimmings in a bag. Mark handed Riven a glass cup and a piece of paper. "Fad Roach", attempting a new cleanse. 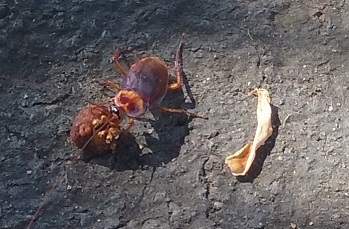 SCP-723-J-1 is a Periplaneta Americana (American cockroach) believed to be a distant relative to SCP-723-J. SCP-723-J's anomaly manifests in its unusual preoccupation with following popular human behavioral trends, such as dieting, specialized exercise regimens, and intelligent technology for the home environment. Individuals who encounter SCP-723-J-1 will take note of its overzealous desire to be seen as hip and stylish. Dr. ██████: Where did you get that? Are you sure it’s good for your digestive system? Dr. ██████: Do you think Sad Roach would be happy that you’re so obsessed with dieting? Is this new cleanse really necessary? Dr. ██████: Isn’t this the third diet you’ve tried in the last week? Dr. ██████: Fad Roach, no. “Fad Roach? That’s a new one.” Mark wheeled in a small green waste disposal bin into the Kiryu Labs spare room, where Riven was reading aloud from a sheaf of papers and chuckling. Two glass jars, each with a cockroach inside, were next to him on a countertop. “Agent Shen, huh? Resident roach murderer? Should we let him in on the inside joke?” Mark had placed the jars of roach onto a wheeled cart. "I admit, I'm curious to see what he would write." 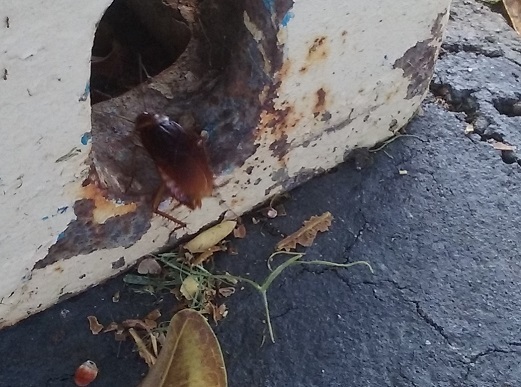 SCP-723-J-2 is a Periplaneta Americana (American cockroach) believed to be a younger cousin of SCP-723-J. SCP-723-J's anomaly manifests in its deep, frequently-displayed emotional turmoil, comparable to that of SCP-723-J but evidently not to the point where SCP-723-J-2 would garner the same amount of attention from observers. While SCP-723-J-2 appears to shun socialization and human contact, it is currently believed that its attempts to discourage interaction are in fact intended to raise concern and attract sympathy for it. Any destructive outbursts exhibited by SCP-723-J-2 appear to follow this pattern of behavior. Dr. ██████: Mad Roach, did you chew another hole in your room again? Dr. ██████: You need to open up to your friends about when you’re upset. Dr. ██████: You can’t throw tantrums every time you don’t get what you want! Dr. ██████: Mad Roach no. Two hours later, after the entirety of Kiryu Labs had been deemed pest-free and the monthly roach wrangling had concluded, Dr. Riven Mercer found himself attempting to explain a joke about roaches. “What roach?” Agent Tai Yang Shen, Foundation field agent and Kiryu Labs’s resident man of few words, was sitting at a table in the break room, peeling an apple with a pocket knife. “Sad Roach.” Riven was perched on the end of the same table, gnawing on a slice of toast. “No, the roach you, uh… ran into a few weeks ago. You honestly don’t remember?” After picking at the crust, Riven crammed the rest of the toast into his mouth. “I often dispose of lab roaches. I remember the ones outside more. I let them live since they’re food for the bird families.” With an idle flick of the knife, Shen tossed a large scrap of apple peel into the nearby green waste bin. “Okay… well, uh… Mark invited you to write a joke article if you want, since it’s the New Year and all, and we figured that we’d try and get everyone to socialize more this year? Group solidarity and whatnot? And this is something that all the interns and some of the joint researchers do during downtime to practice writing and stuff, and we have a format for the roaches as a funny thing we do for everyone who helps out with the cleaning, and each person has their own approach… haha… unintentional pun… I mean…” Riven paused in the middle of gesturing wildly, having realized that he was gesturing wildly. SCP-723-J-3 is a Periplaneta Americana (American cockroach) believed to be the biological father of SCP-723-J. SCP-723-J-3's anomaly manifests in its deep disappointment with SCP-723-J, and its ability to induce feelings of guilt in any intelligent being that encounters it and hears the story of how its dreamer of a son failed to accomplish anything worthwhile in life. Dr. ██████: Can’t you forgive your son? Was what he did really that deplorable? Dr. ██████: He was just trying his best to make it in the world, even if he didn’t follow the path you wanted him to take. Dr. ██████: Will you at least speak to him one last time? Mark glanced at Riven, and Riven glanced back at Mark. The Dad Roach paper was still placed with the other Roach Files, for posterity. Meanwhile, Agent Tai Yang Shen loaded the last of the green waste into the disposal unit outside, pausing as he noticed yet another cockroach scuttling around the trash cans nearby. Shen nudged it into a clump of weeds bordering the planted areas in the building’s courtyard. “I assume you’re happy to be alive,” the agent muttered contemplatively. The roach, undeterred, crawled back out of the weeds and sat on the toe of his right boot. 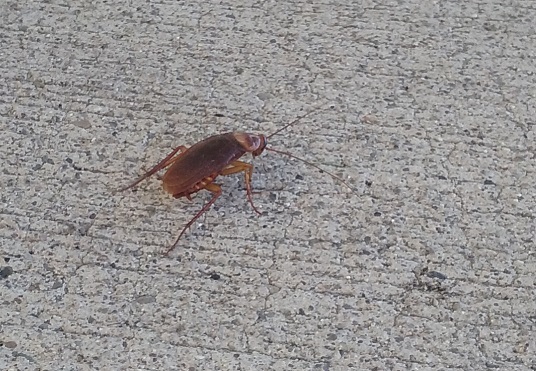 “Glad Roach, no.” he said pleasantly, shaking his foot and flipping the insect back into the planters. The roach wiggled its antennae at him and disappeared into the bushes.